Rescue workers move a body after an attack on the Chinese consulate, where blasts and shots were heard, in Karachi, Pakistan, Nov. 23, 2018. 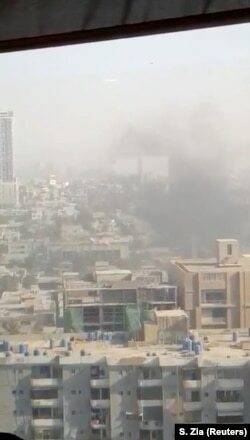 Smoke rises from the Chinese consulate after an attack by gunmen in Karachi, Pakistan, Nov. 23, 2018, in this still image taken from a video obtained from social media. Members of the bomb disposal unit, checking the explosives recovered from a bag, after an attack on the Chinese consulate, in Karachi, Pakistan, Nov. 23, 2018.